I have spent a couple of weeks cycling around the Netherlands with family this summer and there follows things which I noticed and thought interesting. In the main I was very impressed with the Netherlands, they have great infrastructure and friendly people who are very willing to help lost or confused visitors. The Dutch know that they live dangerously, on the edge of what is possible with much of the land below sea level. I got the impression that this left them with a closer affinity with their land than we have with ours; they know they need to care for it or they will lose it. Partly this was seen in the way that climate change is so much on their radar. They know what is coming and are taking steps to try and stop it and to deal with it when it comes. Unfortunately their prospects do not look good. This year as last year my summer holiday took me somewhere which might not be there for my children or grandchildren to see, the Netherlands will be a very different place in 2100 than it was this summer. You also find that this attitude runs further back; it is not a recent change brought about by a new threat but a strengthening of resolve which has been required throughout the history of the Netherlands. It is seen in the trees. The Netherlands has an artificial landscape but it is full of trees, tiny cycle paths are lined with trees, roads small and large are lined with trees, some roads have as many as six lines of trees running down them separating the houses from the road from the footpath from the garden and back through the footpath and road to the houses again. This is wonderful. You only really notice how integral trees are to the street-scape when you see this done properly. In Delft for example (a beautiful city), there were blocks of flats such as you might see in sink estates in the UK, yet they were on roads lined with trees and many balconies were filled with flowers by residents who clearly enjoyed living there. Similarly the university (TU Delft) is beautiful, yet clearly built in the 20th century, using styles that elsewhere have produced horrendous eyesores, yet here perhaps with better architects they are beautiful, surrounded by trees. It was also found in the attitude of the people, towards cycling, renewable energy, recycling and so on. They are on-board with a project to build a better future in a way that they UK clearly is not for they know that if they do not achieve a better future then they will find they have none. We might find ourselves in a similar situation but doom for us seems less certain and so more easily ignored. Cycling in the Netherlands is wonderful. Our infrastructure is nothing in comparison with what they have. Everywhere there were dedicated cycle paths, even minor roads in the middle of nowhere would have cycle lanes marked down both sides and much of the time there would be a segregated cycle lane. There were also many cycle paths where there are no roads. The Dutch canal system with its dykes gives them an advantage here in that they need access roads along the tops of dykes but cannot have vehicles like cars running along them or the dykes would be damaged. Bicycles however are fine, this makes cycling a much more versatile form of transport as there are many more routes by bike than by car. Similarly in cities many streets are one way, being too narrow for two way traffic with cycle lanes, but almost every ‘no entry’ or ‘one way’ sign has the Dutch ‘except cycles’ sign underneath. These dedicated cycle lanes are better than ours in that they deal with junctions properly having clear lights for the cycles with two sets, one high up and one low down so that they can still be read by the cyclist who is right next to the post. They also give cycles priority over traffic joining from minor roads or turning off roundabouts so that the normal difficulty of having to negotiate every junction carefully is alleviated because it becomes mostly the car driver’s problem and they already have to deal with it to avoid other cars. This combines to develop an attitude in the Dutch people that their cycle is much more useful than their car (if they have one). Talking to one Dutch lady, she said that she could live without her car but not without her bicycle. The only slightly irritating habit was the way that they like their streets lined with bricks rather than tarmac more than I do which results in a little vibration. They also define a ‘cycle’ rather more loosely than we do, motorcycles are also ‘cycles’ small four wheeled vehicles which can carry two people seated next to each other and which look like a tiny car with a motorcycle engine are ‘cycles’. Wheelchair bikes either driven by the wheelchair user with their hands or by someone else on a more conventional looking bike frame attached to the back are cycles, as are huge range on innovations with varying numbers of wheels, luggage space and passengers. 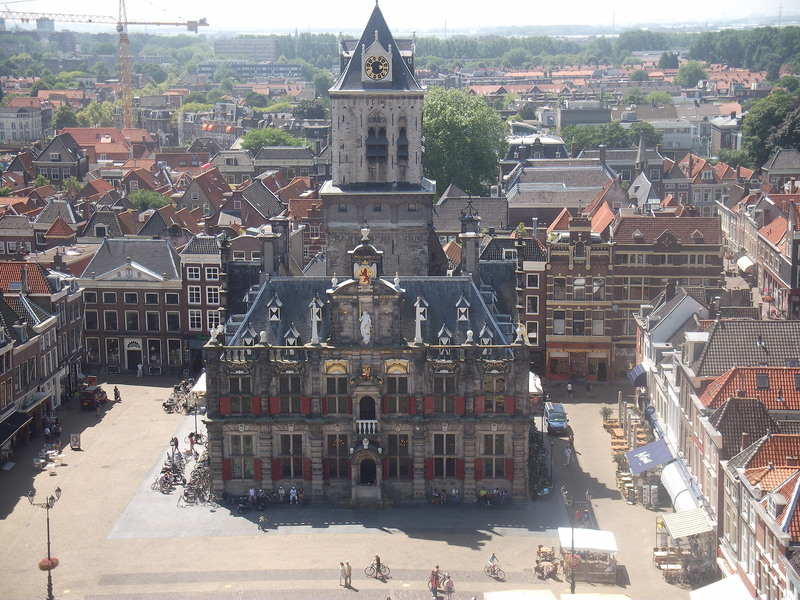 Some of these designs have already been imported to Cambridge, but the Netherlands still has greater variety. Having invented the bicycle we picked the side for the chain based on cycling on the left hand side of the road – such that when standing on the pavement the chain is on the other side of the bike. Unfortunately in the Netherlands they cycle on the wrong side of the road and so they all have chain guards. In the Netherlands the people do not wear helmets except when on racing bikes and wearing lycra, this distinguished us somewhat from the locals as we were on town bikes and wearing normal clothes and yet had helmets. 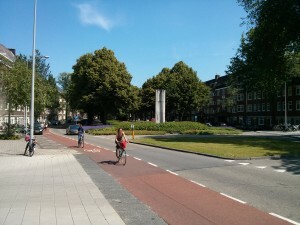 A rather good BBC article on cycling in the Netherlands has been published recently. I used Open Street Map (OSM) (specifically the OSMAnd app which has paid and free versions) and it was great, with offline route finding and location searching, which were invaluable. Being able to answer questions like ‘where is the nearest post box’ or ‘where can I get food’ and ‘how do I get there’ without having any internet is incredibly useful. I am definitely going to switch to using OSM rather than Google Maps in future and to actively contributing things which are missing from the OSM data. This also has the benefit that Google will not know what I am planning quite all the time. We followed “Cycling in The Netherlands – The very best routes in a cyclist’s paradise” by Eric van der Horst (ISBN: 978-1900623193) which was excellent. Amsterdam is a beautiful city with lots of beautiful streets like the tree-lined Churchill Laan mentioned earlier and lots of canals. There are also many parks such as the Vondelpark where we cooked dinner two nights. The Rijksmuseum is full of great painting and well worth a visit, I did not find the Van Gough Museum as impressive but still worthwhile. Utrecht had some interesting buildings and streets. The castle of De Haar (or at least its gardens) were beautiful and the Farm Hazenveld camp site was lovely. Gouda had a large market and lots of cheese with many nice buildings. Delft as previously mentioned is particularly beautiful – my favourite city in the Netherlands – the view from the church tower is particularly good and the [De Grutto camp site](http://www.degrutto.eu/) particularly excellent (particularly for the ecologically minded being solar powered and situated in an orchard in a nature reserve). ‘t Kraaijenest in De Lier was a particularly excellent B&B though we stayed there through the ‘Friends of the bike’ organisation where members open their homes to cyclists. The organisation is to be recommended we enjoyed both the stays we had with these ‘friends of the bike’. The Hauge is good, though not as good a place to cycle as Amsterdam (still better than Cambridge or London). The Peace Place visitor centre is well worth a visit (and free) and we enjoyed wandering around the town centre. Haarlem is beautiful and the guided tour of the Ten Boom museum particularly excellent. There was also an arts quarter with some very interesting shops such as one full of Lego and 3D printers. IJmuiden’s Havenmuseum was unexpectedly impressive with a huge variety of sea related displays and lots of knowledgeable volunteers explaining about the exhibits. Particularity highlights included a working radar station (clearly not being interfered with by the wind turbines) and an ancient computer doing telegraph Morse to text conversion. Similarly in Amsterdam despite carefully staying well clear of the Red Light District walking back from dinner it was in places necessary to keep eyes very carefully on the canal. While the experience of having tea in cafés in the Netherlands was much better than in the UK – nearly always offered a choice of tea and given a biscuit with it and a little plate on top of the cup of boiling water to keep it hot and to provide a place for the tea bag to go – there were several times when we looked at ‘coffee shops’ suspiciously and walked on as it looked like they might be selling more than ‘coffee’. Accidentally walking into a drug dealer’s establishment is not normally something I need to be concerned with ensuring and I prefer it that way. The Netherlands is a great country to visit and everyone we spoke to had enough English that we could get by. Taking your bike on a ferry and cycling around it is definitely a good way to go.